Freeways are notorious amongst urban planners for destroying neighborhoods, but tearing them down is often impossible due to the infrastructure needs of our auto-centric nation. 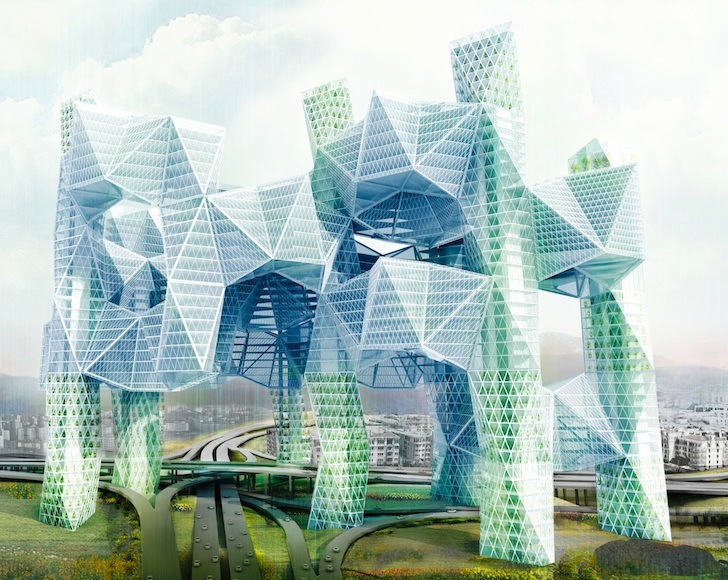 To repair the severed urban fabric, a massive Skyvillage has been proposed to connect Los Angeles' four city quadrants separated by the intersection of the 101 and 110 freeways. Winner of an Honorable Mention in the 2014 eVolo Skyscraper Competition, the Skyvillage promises a pollution-fighting, car-free building that's elevated almost as high as the pie-in-the-sky proposal itself. Submitted by Ziwei Song, the utopian Skyvillage aims to foster social interaction and cultural exchange between the city’s four, currently separated quadrants: Downtown, Chinatown, Echo Park, and Temple Beaudry. Described as an “architecture organism,” the gigantic structure would incorporate mixed use programming to promote a car-free lifestyle. Although it’s not clear how people are meant to enter and exit the Skyvillage, or if the building is meant to function as a contained utopia a la “The Truman Show,” Song writes that residents would be able to easily fulfill all their living and entertainment needs within a half-mile radius. The giant pillars that support the building double as “green filtering towers” filled with vegetation to absorb freeway pollution. With pollution-fighting capabilities and a car-free, community-centered lifestyle, Skyvillage captures what many of us would love to see in our own neighborhoods. The problem, however, is that simply regurgitating our well-known desires into a futuristic and flashy skyscraper isn’t particularly helpful, especially when the proposed solution is one that literally steps over the problem rather than facing it head-on. The view of downtown from Skyvillage. Described as an "architecture organism," the gigantic structure would incorporate mixed use programming to promote a car-free lifestyle. A view down towards the landscaped green roofs. The giant pillars that support the building double as "green filtering towers" filled with vegetation to absorb freeway pollution. Skyvillage would be built atop the intersection of the 101 and 110 freeways. The utopian Skyvillage aims to foster social interaction and cultural exchange between the city's four, currently separated quadrants: Downtown, Chinatown, Echo Park, and Temple Beaudry.